Russian automotive giant AvtoVAZ has revealed the production versions of its new Lada Vesta SW station wagon and its sporty cousin – the Lada Vesta SW Cross. Taken together with the release of the Lada Xray Exclusive crossover last week, AvtoVAZ's Lada Vesta brand looks set on consolidating its positions at home, while gaining new markets abroad. AvtoVAZ showed off the new station wagons, expected to go on sale sometime in the second half of 2017, in a press release on the company's website on Tuesday. Each car features design elements not seen in the concept versions which were revealed earlier. Among the changes is increased 203mm ground clearance for the Vesta SW Cross, with bigger wheels and the higher suspension giving it improved passability in light off-roading. The production vehicles also feature an external trunk release, a lockable fuel hatch, and rear disc brakes (on some trim levels). Other, more subtle improvements include greater torsional stiffness, 2.8 turns lock-to-lock steering, roof racks, chromed double exhaust, accentuated shark-fin like C-pillar, and improved aerodynamics. 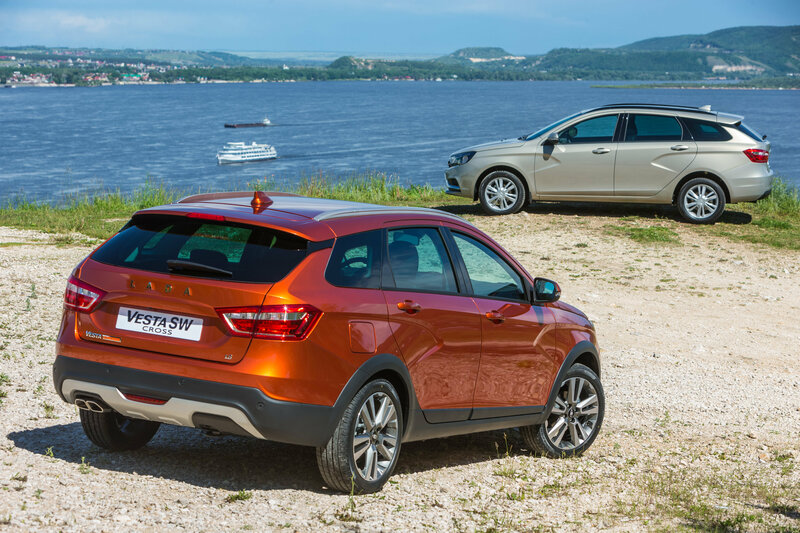 Both wagons retain the distinctive x-shaped design that has come to characterize Lada's Vesta brand cars, created by Lada design director Steve Mattin. Mattin says that the cars are meant to attract buyers looking for a vehicle outside of the traditional segments who want to combine sportiness, practicality, and compatibility with buyers who maintain an active lifestyle. The Vesta SW wagon has roughly the same dimensions as the Lada Vesta sedan, but is 15 mm higher thanks to their roof rails, for an overall height of 1,512 mm. The Vesta SW Cross, meanwhile, has an overall height of 1,532 mm. The Vesta SW Cross's added protective molding also makes it wider and longer than the sedan and base wagon models (1,785 and 4,424 mm vs. 1,764 and 4,410 mm, respectively). Some details, such as trunk space, possible engine variants, and other technical characteristics have yet to be revealed. The trunk lid of one of the production model Vesta's photos seems to show that a 1.8 liter engine is available. This is most likely the 122 hp 16-valve engine available on the Vesta sedan, offered with either a 5-speed manual or 5-speed automatic transmission. The sedan variant also has the option of a 1.6 liter 106 hp engine, although the company has not clarified whether this option will be available on the station wagons. 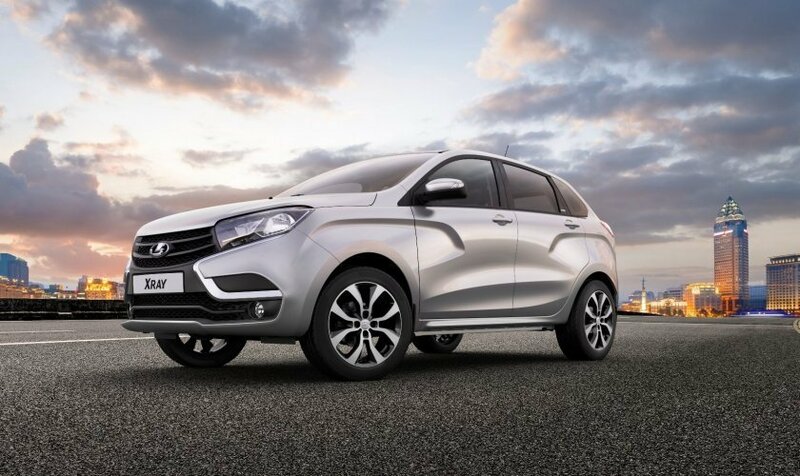 Last week, Lada dealers also began sales of the Lada Xray Exclusive, a luxury trim variant of the Lada Xray compact urban crossover launched last year. The price of the vehicle, which features refinements such as two-tone eco-leather and alcantara seating, stitched steering wheel cover, an eco-leather gearbox selector handle, and other features ranges from 805,900 rubles (about $13,550 US) to about 830,900 ($13,995 US). Other features include an atmospheric interior LED-backlight, door and under dash illumination, climate control, 17-inch wheels, rear view camera, heated windshield, and multimedia and navigation equipment. It goes without saying that the Xray Exclusive is also equipped with features standard on the base Xray, including remote keyless entry, driver's seat height adjustment, LED daytime running lights, dual airbags, ERA-Glonass emergency response system, electronic stability control, ABS, anti-skid and hill-start assist. When first released in the 2015, the Lada Vesta sedan staged what automotive enthusiasts referred to as a revolution in Russian car design. The car was essentially the company's first completely new design, equipped with new technology, modern safety features, and design features meant to dramatically improve reliability. Last month, Russia's Autostat analytical agency reported that the Lada Vesta sedan is now in the top three best-selling new cars in Russia. Car sales in Russia in general were up double digits in May amid an overall improvement in the economic climate.